Custom furniture is like a custom-tailored suit. It fits your needs better and you'll find pleasure for a lifetime. Our furniture is designed and made to order from the ground up. We start by measuring your space and assessing your needs, work with you on selecting unique materials and finish it off with white-glove delivery and installation. Weather your idea is big or small - we know that it is an important part of your home. Made from two slabs of hickory which are joined with clear epoxy in the middle, this coffee table features a stunning wood-grain. Paired with simple and clean steel legs, it is a wonderful addition to a living room. Fifty pounds of rusted steel that were cast right here in Urbana, IL and performed centuries of public service until they were removed during street remodeling. This side table is made from one of a few remaining man-hole covers, once cast by the LEAVITT MFG. CO., which was located at 208 W Griggs St, Urbana. All this happened around 1905, and now over one hundred years later it is the proud side tablefor a young family in Urbana. A home office desk designed for two people. This saves spaces and simplifies the space layout. The L-shape was chosen to allow both people to comfortable enjoy the view into the backyard. On each end, the desk is flanked by a storage unit, custom tailored to the needs of each person. This outdoor storage bench is build from IPE, a south-american hardwood that holds up well to harsh weather conditions. Inside, you find storage creates for paper and plastic recycling, charcoal and barbecue tools. During outdoor gatherings, its also doubles as a seating area. Designed to be a stunning centerpiece for a large room, this 12-foot dining table is made from a single slab of hickory that is over 200 years old. Harvested in southern Michigan and dried for several years, the surface and cracks were sealed with crystal clear epoxy. 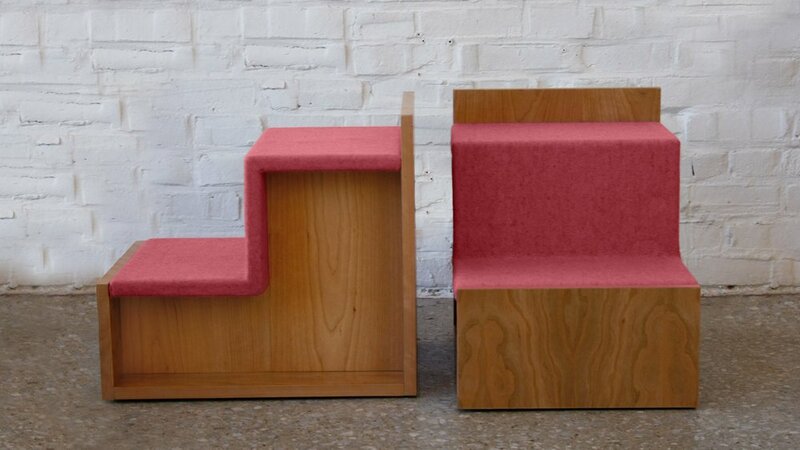 A set of wooden stairs covered with wool felt. The size of the steps were specifically designed for a small dog that couldn't climb stairs as easily anymore. These stairs are placed next to chairs, beds and couches and fit nicely into the home. Of course, they are also used by everyone who needs a little raise.